Posh 'keeper Ban Alnwick has returned to full fitness. Photo: Joe Dent/theposh.com. 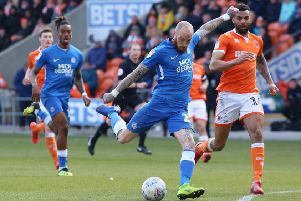 Experienced Peterborough United goalkeeper Ben Alnwick is expected to return for the big League One match at Darren Ferguson’s Doncaster on Saturday (March 19). Alnwick rolled an ankle in training last month which has kept him out of the last four Posh matches. Souleymane Coulibaly scored twice for Posh Reserves in Leeds. Photo: Joe Dent/theposh.com. On-loan 21 year-old Stuart Moore has proven to be an able deputy, but he is expected to return to Reading when his 28-day deal expires. Player-coach Mark Tyler will probably sit on the substitutes’ bench at the Keepmoat Stadium as Posh prepare to send teenage prospect Dion-Curtis Henry out on loan. Posh boss Graham Westley said: “Sometimes you don’t realise what you have until it’s gone and any club would miss Ben. Westley declined to explain midfielder Harry Beautyman’s absence from last week’s (March 12) defeat at the hands of Port Vale. “Harry will be raring to go at Doncaster,” Westley was all Westley would say. Posh have sold just over 700 tickets for the trip to the Keepmoat Stadium. It’s an all-ticket match for Posh fans and they must be purchaded before Saturday. Admission prices have been slashed to £10 for adults and less for those eligible for concessions. Posh are now eight points clear of the League One relegation zone following Oldham’s 1-0 win over Blackpool last night (March 15). Fleetwood, who are 19th, three places below Posh, failed to make up any ground as they went down 1-0 to Walsall, a match watched by Westley. Posh are at Fleetwood on April 5. Posh Reserves beat a strong Leeds United side 3-2 in a friendly yesterday afternoon. Souleymane Coulibaly (2) and Lee Angol scored the Posh goals.